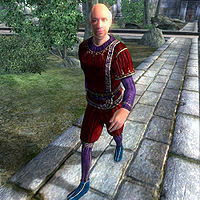 Amantius Allectus is an Imperial commoner residing in the southeast corner of the Imperial City Temple District with his wife, Caula Allectus. Amantius is the target of a Thieves Guild quest, May the Best Thief Win. He is the author of a diary that details his somewhat macabre experiments on plants. Amantius leads an easy-going life. He wakes up every day early at 6am, and eats on the main floor of his house for two hours. He then spends four hours walking around his home speaking to his wife until midday, at which point he heads out on weekdays to eat at the Feed Bag. Once his lunch is over at 2pm, he heads to the Main Ingredient to think about different supplies he may need for his experiments. At 6pm he leaves and heads to the Arboretum, where he wanders until his bed time at midnight. On weekends, he doesn't even make it out of his house until 8pm, when he goes to the Green Emperor Way to wander until midnight. His schedule is seldom interrupted. Like the other Imperial City residents, he is subject to martial law during the Light the Dragonfires quest. Also, while you are trying to steal his diary during the May the Best Thief Win quest, he will conveniently be asleep upstairs in his house until the journal has left the premises. One last disturbance is that as long as Mog gra-Mogakh has not died, he will go to the Black Horse Courier at midday on the 9th of each month, and will hang around for a brief amount of time before resuming his normal schedule. Amantius wears typical upper class apparel: a red velvet garment, a red velvet blouse, and blue suede shoes. He also carries with him at all times his house key and a small amount of gold. Before his diary is stolen, whenever you speak to Amantius he will greet you with, "I think someone is watching me. I see figures in the shadows all the time. I know it's all in my head. I'm spending too much time on my latest project. But enough about me. What can I do for you?" If you happen to steal his diary before ever speaking to him, then the first time you speak to him (and 20% of the time thereafter) he will say, "I'm Amantius Allectus, the writer. I'm working on a new edition of 'Lives of the Saints'." When asked about the Imperial City, Amantius will tell you "I'm here in the city for access to the Temple libraries, and for the bookstores... especially the First Edition in the Market District." May the Best Thief Win: You want to join, but are you a good enough thief? Amantius Allectus was killed during a burglary. They say the house was ransacked. Amantius Allectus is complaining about crime in the city. Someone actually broke into his house and stole his diary. Amantius claims to be working on a second edition of Lives of the Saints. Despite the identical title, this book is most probably not the same as the Lives of the Saints published by the Tribunal Temple. Amantius Allectus's project is a spoof of the movie Little Shop of Horrors, which is about a man who feeds a talking plant with his own blood until it becomes large enough to eat people whole. In some cases, when you select "rumors" while talking to Amantius, he will speak to you about the ransacking of his own house as if he were someone else. Esta página foi modificada pela última vez à(s) 17h33min de 26 de julho de 2015.